Oceanfront Beachfront balcony Private rooftop terrace Spacious condo. Great design. Fully equipped kitchen. Breakfast bar. Breakfast bar. Master bedroom. View from bed Second bedroom. Private Rooftop Terrace. Unit`s floor plan. Bahia Encantada. Bahia Encantada. Beachfront pool. View from the pool. Elegant community. Romantic getaway. 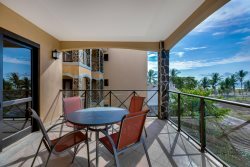 This stylish and spacious two bedroom, two bath Bahia Encantada Junior Penthouse comes fully furnished with everything you and your guests need to enjoy a carefree tropical vacation that you won't soon forget! Featuring several private dining and lounging balconies, with stunning views of the ocean and beach below, you and your guests can relax and take in the beauty of your surroundings from the comfort of your own unit. The private rooftop terrace facilities watching the surf action and magnificent Pacific sunsets. The open-concept living area features comfortable seating, a flat screen TV, and easy access to the private balconies and kitchen. The elegant and modern kitchen is fully equipped to meet your cooking and entertaining needs, with full-size stainless steel appliances, granite countertops and a large breakfast bar. Other kitchen appliances include a fridge, freezer, dishwasher, oven, toaster, blender, coffee maker and microwave. The master bedroom has sliding door access to the main dining balcony and features a king-size bed, in-suite bathroom and flat screen TV. The guest bedroom is located just down the hall from a full guest bathroom and features a queen-size bed, flat screen TV, and balcony access. Premium linens, plush pillows and a full-size washer and dryer unit top off the long list of amenities included with this unit. If you want to experience an unforgettable vacation, full of luxury and comfort, this unit is the one for you! You get our bespoke concierge at your service for anything from arranging a transfer to requesting a personal chef. Please contact us for more detail from the United States at 844-800-5226 or from Costa Rica at (506) 401-5226. Thank you!